I’m not sure if the Benjamin Latrobe-like klismos side chair in the foreground is original to Lemon Hill, but the curving door is. This interesting detail is on the second-floor landing of the central mass of the house in Fairmount Park in Philadelphia, one of the finest examples of Federal style architecture. I can honestly say I have never seen a door and door frame follow the curve in a wall! This landing is part of a grand, curving staircase in the central, bayed pavilion of Lemon Hill. 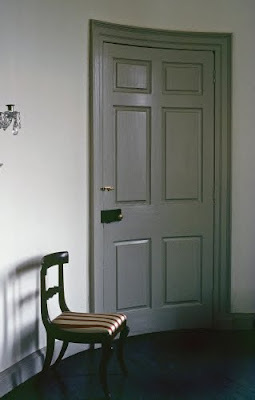 The curving back splat of the chair, as well as the door and frame, may be early examples of steam-bent wood furniture. I can’t imagine cutting the door and frame from a hunk of wood. In a different medium, I have seen window glass in curved bays on some of Latrobe’s (1764–1820) houses on Beacon Hill in Boston. 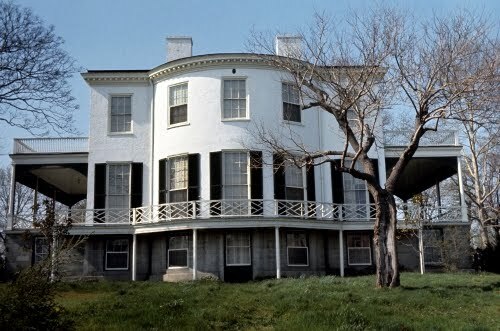 Lemon Hill was built by a wealthy merchant of Philadelphia Henry Pratt (1761–1838). He bought the Lemon Hill property in 1799 for a little over $14,000 for 43 acres. It included an elegant greenhouse, hot houses, and formal gardens. Pratt had made his money exporting timber and flour to the West Indies starting in the 1780s. He imported molasses (what people used as a sweetener instead of sugar through the 1800s), coffee, wine, and gin. After Anglo-French war developed during the French Revolutionary period (1792–1793), he shifted his commerce to Hamburg and Bremen, Germany, and eventually traded with China and Latin America. He imported silk and Chinese porcelain into the young United States, some of which can still be seen at Lemon Hill. I feel that Antonio Gaudí is one of the most brilliant examples of an artist who fully embraced the spirit of the Arts and Crafts movement in Europe in the late 1800s. This tile work on this early residential commission is much more restrained than some of Gaudí’s later work, such as Guell Park, but it lends a liveliness to the façade’s push-and-pull of projections and recessions. 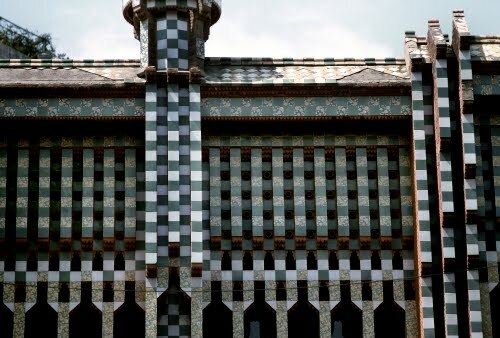 The floral tiles are reminiscent of Spanish Mudejar work, while the contrasting of light and dark tiles reflects Spain’s historic Islamic architectural influence. 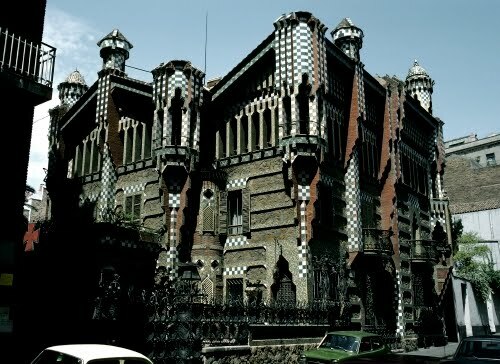 Casa Vicens is Gaudí's first residential commission in Barcelona. It sets the tone for his later architecture, representing the ultimate expression of the Arts and Crafts Movements aesthetic in early modernist architecture in Spain. It is an asymmetrical arrangement of masses, with projecting corbels and pilasters, and elaborately carved and decorated chimneys, a staple of Gaudí's mature designs. The house is a modernist conglomeration of cherished past styles, from Islamic horseshoe windows and brightly colored Spanish Renaissance Mudejar-type tile work, to a modern interpretation of Gothic arches, seen partly above.